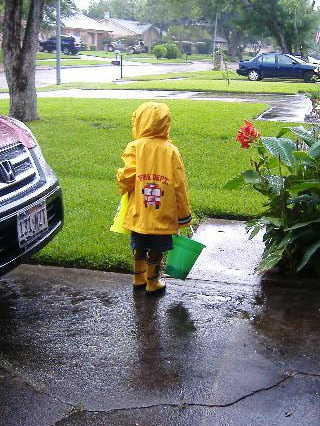 >With all the rain we’ve had recently, practically every.single.day for weeks, Kiddo has put his new raincoat and galoshes to use. Disclaimer – Kiddo knows he’s not allowed to play at the end of the driveway. We were just there because that is where the biggest puddles were AND I was standing in the street taking pictures.